X Milotic ist atemberaubend schön. Man sagt, dass diejenigen, die es sehen, vergessen zu kämpfen. X Milobellus est d’une beauté à couper le souffle. Ceux qui en voient un perdent aussitôt l’envie de se battre. X Milotic es impresionantemente bello. Quienes lo ven, temen perder las ganas de luchar contra él. X Pokémon di una bellezza vertiginosa. Chi lo vede perde ogni voglia di combattere. X 밀로틱의 아름다운 모습을 본 이는 싸우려던 마음가짐을 잊어버린다고 한다. Y It is the world’s most beautiful Pokémon. There are many works of art featuring Milotic. Y Dies ist das schönste Pokémon der Welt. Es gibt viele Kunstwerke, die Milotic darstellen. Y Le plus beau Pokémon du monde. De nombreuses œuvres d’art représentent Milobellus. Y Es el Pokémon más hermoso del mundo. Milotic ha inspirado numerosas obras de arte. Y È il Pokémon più bello del mondo. Ci sono parecchie opere d’arte ispirate a Milotic. Y 세계에서 제일 아름다운 포켓몬이다. 밀로틱을 모델로 한 회화나 조각이 많이 있다. 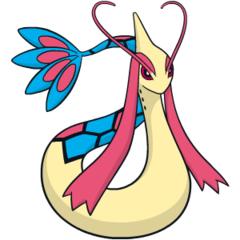 Omega Ruby Milotic live at the bottom of large lakes. When this Pokémon’s body glows a vivid pink, it releases a pulsing wave of energy that brings soothing calm to troubled hearts. Omega Ruby Milotic lebt auf dem Grund großer Seen. Wenn dieses Pokémon rosa leuchtet, gibt es eine Energiewelle ab, die einem zornigen Herzen wohltuende Ruhe verschaffen kann. Omega Ruby Milobellus vit au fond des grands lacs. Lorsque le corps de ce Pokémon devient rose vif, il libère une pulsation d’énergie, capable d’apaiser les esprits agités. Omega Ruby Milotic vive en lo más profundo de los lagos. Cuando intensifica el color rosa de la piel, libera una fuerte onda de energía que tranquiliza a todo el que tenga el ánimo alterado. Omega Ruby Milotic vive sui fondali dei grandi laghi. Quando il suo corpo riluce di un rosa intenso, rilascia una forte onda energetica, in grado di placare gli spiriti irrequieti. Omega Ruby 큰 호수의 밑바닥에 살고 있다. 몸이 선명한 핑크빛으로 반짝일 때 피폐해진 마음을 치유하는 파동을 발산한다. Alpha Sapphire Milotic is said to be the most beautiful of all the Pokémon. It has the power to becalm such emotions as anger and hostility to quell bitter feuding. 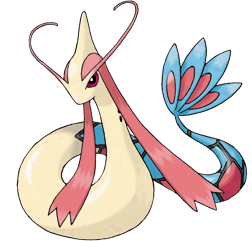 Alpha Sapphire Milotic soll das schönste aller Pokémon sein. Es hat die Macht, Emotionen wie Wut und Feindseligkeit zu besänftigen und somit erbitterten Streit zu vermeiden. Alpha Sapphire Certains prétendent que Milobellus est le plus beau de tous les Pokémon. Il a le pouvoir d’apaiser certaines émotions comme la colère ou l’hostilité, afin d’éviter les querelles inutiles. Alpha Sapphire De Milotic se dice que es el Pokémon más bello. Tiene la capacidad de calmar sentimientos tales como el miedo y la hostilidad, y apaciguar las relaciones de áspera enemistad. Alpha Sapphire Pare che Milotic sia il più bello tra tutti i Pokémon. Ha il potere di placare emozioni come la rabbia e l’astio, domando così anche le più accese controversie. Alpha Sapphire 가장 아름다운 포켓몬이라고 불리고 있다. 분노나 증오의 마음을 치유하여 분쟁을 진정시키는 힘을 지니고 있다. Sun Milotic has provided inspiration to many artists. It has even been referred to as the most beautiful Pokémon of all. Moon It lives at the bottom of clear lakes. In times of war, it shows itself, which soothes people’s minds and hearts. Ruby Milotic is said to be the most beautiful of all Pokemon. It has the power to becalm such emotions as anger and hostility to quell bitter feuding. Sapphire MILOTIC live at the bottom of large lakes. When this POKeMON's body glows a vivid pink, it releases a pulsing wave of energy that brings soothing calm to restless spirits. LeafGreen MILOTIC is breathtakingly beautiful. Those that see it are said to forget their combative spirits. Diamond When people bicker, it is said to arise from the depths of lakes to becalm violent hearts. Pearl It is the world's most beautiful Pokémon. There are many works of art featuring MILOTIC. Platinum Its lovely scales are described as rainbow colored. They change color depending on the viewing angle. HeartGold It’s said that a glimpse of a MILOTIC and its beauty will calm any hostile emotions you’re feeling. SoulSilver It’s said that a glimpse of a MILOTIC and its beauty will calm any hostile emotions you’re feeling. Black Its lovely scales are described as rainbow colored. They change color depending on the viewing angle. White Its lovely scales are described as rainbow colored. They change color depending on the viewing angle. White 2 Its lovely scales are described as rainbow colored. They change color depending on the viewing angle.